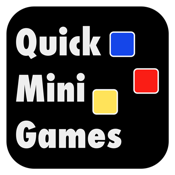 Six mini-games to test your reflexes and reaction time. You can post your results on facebook to share with your friends and see who is faster. * 30s: Are you able to count 30 seconds mentally? * React: How fast can you react to the appearance of an element? * Lights: What if there are more places where the item could appear, you will be as fast as before? * Colours: How fast are you counting items? * Chairs: Have you ever played musical chairs? Maths: How fast are you doing some maths operations?